Tony Romo is one of those rags-to-riches stories that sports fans love to hear about — unless you hate the Dallas Cowboys, that is. 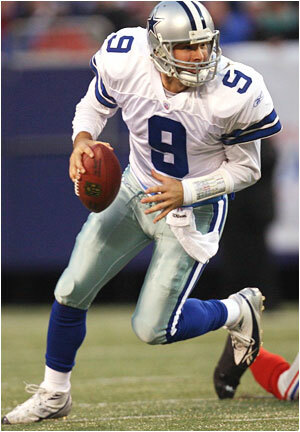 Tony Romo went undrafted in the NFL Draft out of East Illinois State University. The Dallas Cowboys offered Romo $10,000, a mere pittance in NFL football terms, to sign with them. The Denver Broncos doubled the offer to Tony Romo to $20,000, and therefore should have won the bidding. But Tony Romo and his agent decided Tony had a better chance of making the Dallas Cowboys roster, and therefore chose the Cowboys. This shows two things about the NFL. One, it’s usually better to go undrafted in the NFL Draft and choose your own team than it is to be drafted in the 6th or 7th round, where teams probably don’t value you that much and you have no choice of destination. Two, the NFL is a who-you-know world. The Dallas Cowboys were interested in Tony Romo because ‘Boys assistant coach Sean Payton attended Eastern Illinois, and therefore was aware of the lightly-touted Romo. The Denver Broncos were interested in Romo because Mike Shanahan is also an Eastern Illinois alum, and therefore he was aware of Romo’s talent. Long story short, Tony Romo signed with the Dallas Cowboys and made the squad in Bill Parcells first year with the Cowboys (2003). 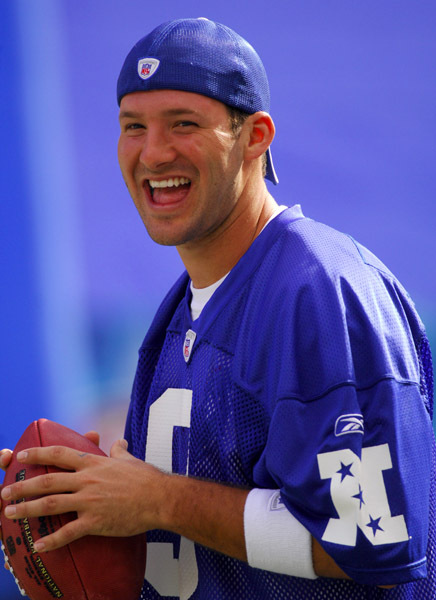 Romo made the squad as the 3rd quarterback behind Quincy Carter and Chad Hutchinson as the 1 and 2 QBs. Things looked bleak for Romo going into 2004, as Jerry Jones traded a 3rd rounder to the Houston Texans for Drew Henson, so Romo appeared the odd man out. Instead, Quincy Carter was released for drug-related reasons, while Chad Hutchinson was released to make room for newly-signed Vinny Testaverde. After a losing season with Vinny Testaverde at the helm, the Cowboys signed Drew Bledsoe to be their starting wide receiver. Another losing season followed, though Tony Romo had moved up to the #2 spot behind Bledsoe. In the 2006 offseason, Sean Payton moved to the New Orleans Saints as their head coach, and he tried to trade for Tony Romo. Payton offered a 3rd round pick in exchange for Romo, but Jerry Jones wanted a 2nd rounder. Luckily for the Cowboys, the trade never happened. Entering the 2006 season, many Cowboys fans wanted Romo to be the starting quarterback. But then, Cowboys fans often want the back-up QB to be the starter, so this was more a sign of concern over Drew Bledsoe’s key mistakes than a show of faith in Romo. The team had signed Terrell Owens in the offseason, so the Cowboys quarterback needed to get T.O. the ball. Parcells went with Drew Bledsoe to start the season, though local media (Babe Laufenberg, for one) began reporting in late training camp that Romo might get the nod if things went badly. Sure enough, the Cowboys started slow and Tony Romo relieved Bledsoe at halftime in a key Monday Night Football matchup in early October. Romo threw an interception in his first pass against the Giants, then went on to look more solid in a failed comeback attempt. Tony Romo got the start the next week and became on of the feel-good stories of the 2006 NFL Season. That was, Romo was a feel-good story until the fumbled snap on a late field goal in a playoff game against the Seattle Seahawks. The short kick would have put the Cowboys ahead with less than two minutes, but instead, the Dallas Cowboys turned the ball over late. I always felt that the Seahawks (who had a minute and a half) were likely to drive on the Cowboys’ poor pass defense and set up Josh Brown for a game-winning field goal of his own; but the fact of the matter is, Tony Romo fumbled the ball on the biggest play of his life, so he came out looking like a choker. Many wondered how he would respond in the 2007 season. Romo’s response was to lead the Dallas Cowboys to an NFC-best 13-3 record and the #1 seed in the NFC Playoffs. Once again, though, the Dallas Cowboys flamed out too early in the playoffs, eventually losing in Texas Stadium to the eventual world champion New York Giants. That brings us to Tony Romo in his second full season as an NFL quarterback. Once again, Romo has some of the best weapons in the NFL: Terrell Owens, Jason Witten and Marion Barber. The Cowboys have serious questions at their 2nd wide receiver position, though they did add Felix Jones as a potential game-breaker at running back and Martellus Bennett as a talented 2nd TE option to Witten. (The Cowboys use two tight ends and no full back in most sets, so Bennett should be a starter in replace of Anthony Fasano.) Barring injuries, Tony Romo should be a lock for a huge fantasy football season. Romo is 3rd on most fantasy football quarterback lists, usually behind Tom Brady and Peyton Manning. You might see Drew Brees or Carson Palmer ahead on a few lists, but Romo is one of those dream picks for most fantasy owners. Regardless of whether Tony Romo or the Dallas Cowboys "choke" in the playoffs again, that won’t affect their fantasy stats. More concerning is the Dallas Cowboys December collapse these past three seasons. I would argue the collapses have as much or more to do with a defensive collapse as Romo’s doing, though last year’s offensive drop-off (and the playoff loss) had a lot to do with the December high-ankle sprain injury of Terrell Owens. Assuming health and improvement on defense (Pac-Man Jones, Zach Thomas, Mike Jenkins, the improvement of Anthony Spencer), the Dallas Cowboys might finally be able to avoid a late-season collapse. It’s a concern, though, because Tony Romo’s production drop-off these past two seasons have come during the fantasy playoffs. Two years ago, I won a league I shouldn’t have won because Tony Romo and Jason Witten had their worst game of the year against my fantasy football team. Last year, Tony Romo had a bad week in the fantasy playoffs and screwed my team. So that becomes a problem for fantasy owners looking for strong finishers. If that’s the worst you can say about a fantasy quarterback — that he might screw you in the championship game — I’ll take my chances with that player. Fantasy football is about making the playoffs and hoping for some luck, so I would draft Tony Romo in the 3rd round or later and hope for the best. With Terrell Owens and Jason Witten to throw at, he should be a difference-maker in most leagues.